Maybe you should create a sign up so you know how many people to expect. 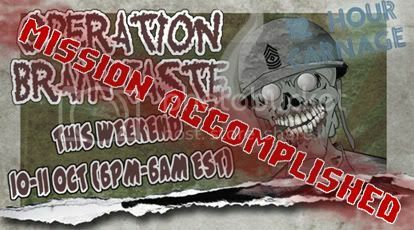 Don't forget that this weekend is operation BRAINTASTE!!!! How many people showed up for this? more like 90%..Operation Shrouded Eagle was a server killer. But it came back after we took it off. For some reason I thought this was going to be an AA3 event. What exactly does this have to do with Halloween, since it is over and Halloween has yet to arrive? how does it not? its October, fall, and Halloween is coming soon. Doesn't have to be on Halloween to be a Halloween bash. It was a community invite to a pub-a-thon. Where normal people that are in Western Hemisphere can stay up past normal hours of operation and play with people all night. Most Servers at those hours aren't occupied unless they are Eastern Hemisphere. As for Halloween, your right my intentions wasn't Halloween oriented. The Brain taste was the feeling that you get after 12+ hours of pubb'n straight. How your brain handles it. I started these Pub-a-thons and am continuing them every month just to bring more life and community involvement back to AA. This is an olive branch. Please feel free to join us during our next one. We are looking at possibly running two servers next time since one was full for most the night. These are AA2 pub-a-thons purely because AA2 has more maps. Also the dates were chosen to coincide with people that are in school and have those days off.